I recently had the privilege to spend a few nights in Tswalu and after hearing so many great stories I was not disappointed. Situated in the heart of the Kalahari wilderness lies one of the greatest conservation success stories in Southern Africa. This vast area offers a safe haven for many endangered and rare species while protecting an area of unique diversity and beauty. The sheer size of the reserve, together with the arid environment and nomadic nature of the game creates a sensational wildlife experience. It is matched by personalized service, attention to detail and luxurious accommodation that overlooks this magical landscape. 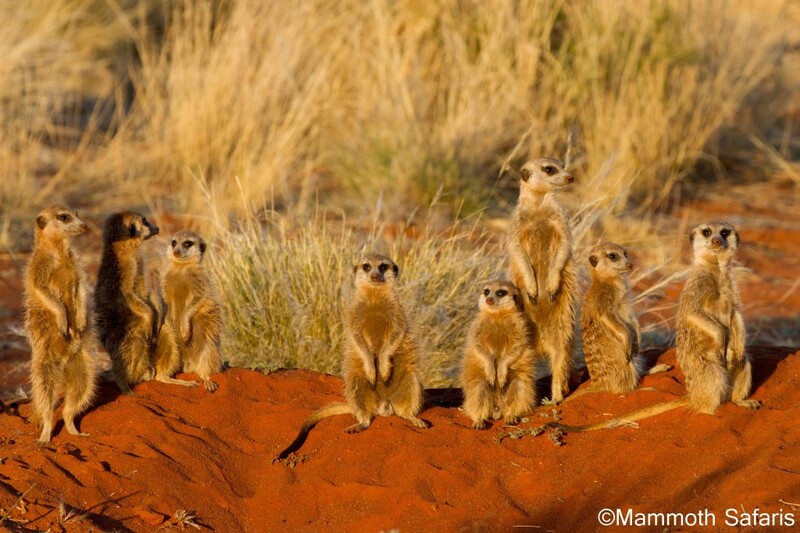 One of the highlights at Tswalu is spending time with the meerkat’s. In the late afternoon they head back to the safety of the burrow but before they go down they spend a few moment gathering the warmth of the sun. This is a fantastic photographic opportunity for any enthusiast or amateur. As evening approaches the meerkat’s slowly move underground as the temperature starts dropping. This individual enjoyed the last bit of warmth from the sun before heading off for the evening. The fine, red soil of the Kalahari adds some great colour to your photographs. We spent some time around a waterhole where during the heat of the day a variety of animals came down to drink. This wildebeest kicked up a bit of dust moving away from a buffalo. After almost two hours of tracking, our experienced guide and tracker team, Richard and Jonas managed to find this magnificent Black Rhino cow. Usually preferring thicker vegetation she allowed us to get some great views of her and her calf in the scrubby Kalahari vegetation. I can say with confidence that Tswalu has to be the best destination in Africa to see the highly sought after aardvark. Winter is the best time as they come out in the late afternoon or early evening. On one afternoon we had the opportunity to see three different individuals and spent some time sneaking up on foot to try and get a few photos. It really is a magnificent creature. The Motse, built of local stone, rich red clay and traditional Kalahari thatch is nestled at the foot of the Korannaberg mountains, facing westwards across the vast grasslands of the Kalahari. The main guest area is a spectacular place in which to sit back and relax with a drink and enjoy a magnificent African sunset over the Kalahari savannahs. Set amidst two rolling mountain ranges, Tarkuni is an exceptional choice for families or groups of great friends. Tarkuni creates an oasis of serenity in the desert. The home has its own dedicated team including a host and private chef to ensure a completely personal service. A private vehicle, personal field guide and tracker ensure an equally bespoke safari experience. This boma was created for memorable evenings with close family and friends sharing great food and famous South African wines. I absolutely love sitting around a camp fire in the evening under the African stars reminiscing about the days adventures. Mammoth Safaris – The best Gorilla trekking anywhere!